Craft stencils for furniture and fabrics, Reusable stencils for home decor. SMALL: Sheet: 12"x19.5", Design: 9.7"x16"
MEDIUM : Sheet: 24"x14.5", Design: 19.7"x11.8"
Our craft size stencil Casablanca is perfect for smaller DIY home decor projects where a wall stencil would be too large. These craft stencils are great for stenciling your own designer pillows or curtains or transforming garage sale furniture finds into cool decorative pieces. 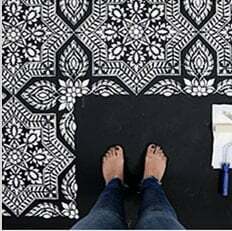 It doesn't end there: try stenciling lamp shades, kitchen backsplashes, doors, table tops, picture and mirror frames, or create your own work of art on pre-stretched canvas. Decorative possibilities are endless with these versatile reusable stencils! Although usually it is not necessary to use spray adhesive with our stencils, adhesive can very helpful if you want to minimize paint seepage or are using high contrasting colors. (Elmer's spray adhesive seems to be the best). Make sure you shake the can well and lightly mist (not drench) the stencil, and let it dry for a moment before positioning it. This step will prevent the adhesive residue transferring to your surface. You'll need to re-mist the stencil after a few repeats. Clean-up tip: Spray the stencil with Simple Green to help to remove adhesive residue. Textile medium is optional: it only makes the acrylic paint more flexible when it dries, which is important for wearables like t-shirts but not so much for pillows and curtains. Complete the stenciling and let it dry fully, 24 hours is best, then heat-set it by ironing the fabric for about 20 sec. ( more or less) on a LOW setting through the piece of cloth. Heat-setting will cure the paint and will prevent it from being washed off in the washing machine. Always experiment with a sample of your fabric first to ensure good results. I've stenciled on silk, cotton, linen and even sheer fabrics with great results. It's always better if your fabric doesn't have too much texture.